Dear Mr Shingleton. Many thanks for your message. I visited your site and it looks truly interesting. Thank you so much for including me in it. The date you're looking for is 1984, when I was the first woman to conduct a BBC Prom at the Royal Albert Hall. Strange to think it took until 1984 for a woman to conduct at the BBC Proms. Fifty-four years earlier the first woman had conducted the Berlin Philharmonic, and she was American. 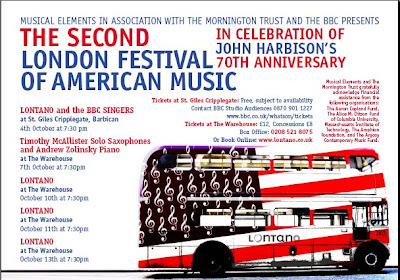 The Second London Festival of American Music looks exceptionally fascinating! I also find it interesting to note that the Festival is featuring John Harbison's music on his 70th Anniversary. It is interesting to me since over here, in Washington, D.C., the autumn season at the Library of Congress, National Gallery of Art, and elsewhere (excepting the John F. Kennedy Center, of course; and Sharon Rockefeller's public classical music station WETA) is focusing on the Carter and Messiaen celebrations and the 70th anniversary of Charles Wuorinen, but not John Harbison. I'll have to double-check, when time allows, to see if there will be any deserved performances of John Harbison in this area this autumn.